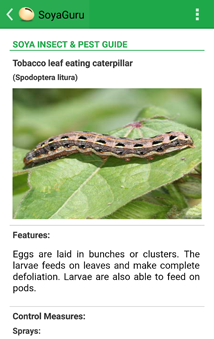 SoyaGuru App is developed for Google Android OS platform using Java Technology and SQL Lite database. 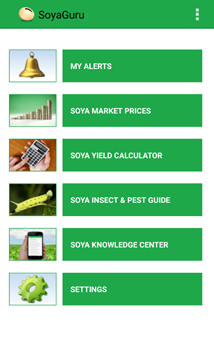 SoyaGuru App utilizes several software applications on the SoyaGuru App & its SoyaGuru.com web site to provide valuable information for the use and enjoyment of our SoyaGuru App & SoyaGuru.com web site visitors and users. We encourage people to download the app but to be careful with personal information and follow good internet safety processes. SoyaGuru App & SoyaGuru.com web site collects and stores the following types of information from users of our Web site: (i) information you voluntarily enter on our Web site or give us in any other way, including, but not limited to, “personally identifiable information” such as your name, address, e-mail address, phone number and facsimile number; (ii) information we collect from you through the use of “cookies” (see paragraph 2 below); and (iii) information we receive from you via e-mail communications. SoyaGuru App and SoyaGuru.com web site may place Internet cookies on your hard drive. Cookies are small files that may be downloaded to your hard disk for record-keeping purposes. Among other things, cookies are used to: (i) remind us of who you are in order to deliver better service; (ii) estimate our audience size by determining repeat usage of our Web site to help target advertisements based on user interests and behavior; (iii) track your progress and entries in promotions, sweepstakes and contests, if any; and (iv) measure certain traffic patterns for use as a research tool to understand how our users’ habits are similar or different from one another. You can set your browser to notify you when you receive a cookie, giving you the chance to decide whether or not to accept it. By not accepting cookies, some Web pages may not display properly or you may not be permitted to access certain information. SoyaGuru App and its Website SoyaGuru.com web site also collects IP addresses (the Internet address of a computer) to track a user’s session while the user remains anonymous. We analyze this data for certain trends in statistics, such as which parts of our Web site users are visiting and how long they spend there. In general, we do not link your IP addresses to anything personally identifiable to you. In those limited cases where session information is not anonymous, SoyaGuru App and its website SoyaGuru.com will provide you with notice of such practice and the opportunity to choose not to allow us to track your session. 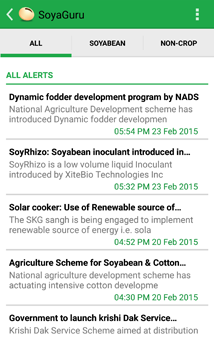 SoyaGuru App may use DoubleClick Banner Advertising Technology, Admobi or similar technology from time to time. Third Party Advertising The ads appearing on this Web site are delivered to you by DoubleClick, our Web advertising partner. Information about your visit to this site, such as number of times you have viewed an ad (but not your name, address, or other personal information), is used to serve ads to you on this site. For more information about DoubleClick, cookies, and how to "opt-out", please go to "http://www.doubleclick.net/us/corporate/privacy"
The personally identifiable information you provide will be used to support your customer relationship with SoyaGuru App and its website SoyaGuru.com. Unless you have chosen to “opt-out” by notifying SoyaGuru App and its website SoyaGuru.com at editor@SoyaGuru.com, SoyaGuru app and SoyaGuru.com may sell, rent, or lease your personally identifiable information to, or share your personally identifiable information with, third parties. Your personally identifiable information may be shared with our agents, contractors or business partners in order that they may perform services for SoyaGuru App and its website SoyaGuru.com, regardless of whether or not you have chosen to “opt-out” as set forth above. SoyaGuru App and its website SoyaGuru.com does research on our users’ demographics, interests and behaviour based on the information provided to us during your use of our Web site. This research is compiled and analysed on an aggregated basis. Aggregated data does not include personally identifiable information. 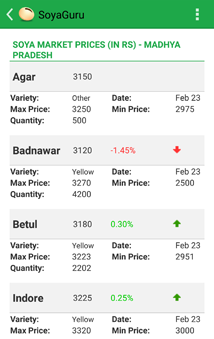 SoyaGuru App and its website SoyaGuru.com may share this aggregated data with others. We will release your personally identifiable information when we believe that such release is appropriate to (i) comply with the law; (ii) enforce or apply our Terms of Access and other agreements; or (iii) protect the rights, property or safety of SoyaGuru App and its website SoyaGuru.com, our users or others. This includes, but is not limited to, exchanging information with other companies and organizations for fraud protection and credit risk protection. Please be aware that SoyaGuru App and its website SoyaGuru.com advertisers or Web sites that have links on our site may collect personally identifiable information from you. The information practices of those Web sites linked to SoyaGuru App and its website SoyaGuru.com either through advertisements or other hyperlinks are not covered by this privacy statement. Third party Internet sites and services accessible through SoyaGuru App and its website SoyaGuru.com have separate privacy and data collection practices, independent of us. 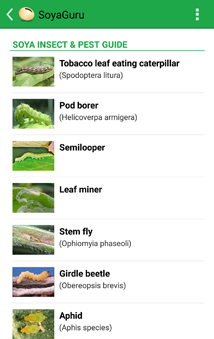 SoyaGuru App and its website SoyaGuru.com has no responsibility or liability for these independent policies or actions. Please be careful and responsible online. If you post personal information online that is accessible to the public, you may receive unsolicited messages from other parties in return. While we strive to protect your information, SoyaGuru App and its website SoyaGuru.com does not ensure or warrant the security of any information through the transmission process, and you transmit information to SoyaGuru App and its website SoyaGuru.com at your own risk. Children should always ask a parent for permission before sending personal information to anyone online. SoyaGuru App and its website SoyaGuru.com encourages parents to take an active role in their children’s use of the Internet and to spend time online with their children. SoyaGuru App and its website SoyaGuru.com will use its best efforts not to collect personal information for those identifying themselves as age 17 or under. Please contact us at SoyaGuru App if you have any concerns or questions. Thank you for visiting our site. We strongly recommend to use this information for general reading but to decide specific crop decisions we recommend you to contact your local agriculture experts. 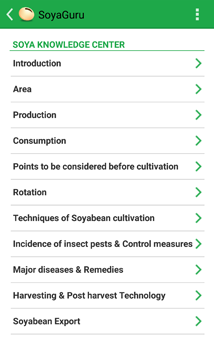 We at Soyaguru takes great care to validate the information published by us for the benefit of farmers but many times standard or assumed Agronomic conditions vary from locations to locations and there could be sudden change in weather affecting the reliability, relevance & context of the information provided by us.